Tattoos can be a painful thing to get done but totally worth it if you believe in what you want to get tattooed on your body or if it has a personal and important meaning in your life and if you can carry it off with full confidence and Elan. It has become a rage and a very fashionable thing to do among today’s youth. Tattoos can be inked on any part of your body: neck, back, chest, belly, legs, arms, wrist, or just about anywhere. 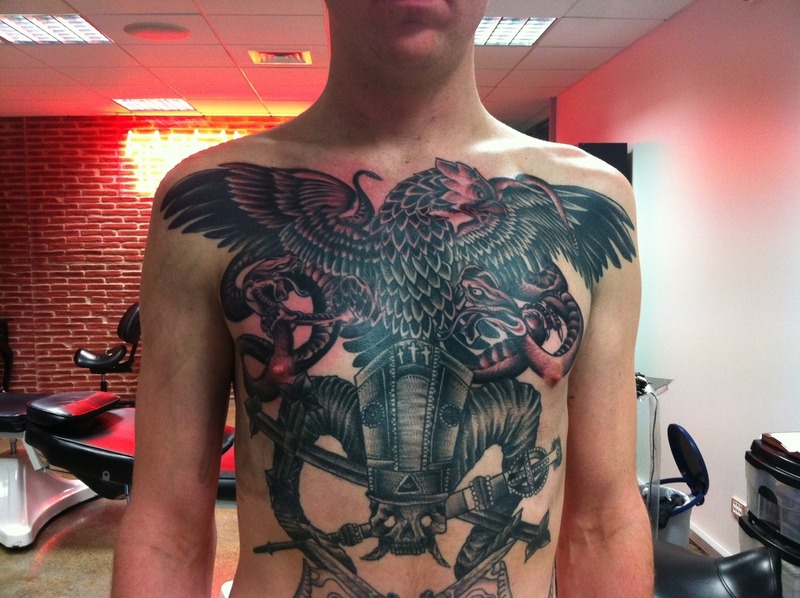 Chest tattoos for men can look very majestic and creative. They can make you look more masculine and tough and surely add a whole new dimension to your appearance and personality. It is of utmost importance that people consider all pros and cons and decide thoroughly well in advance before getting a tattoo on the chest. It is firstly a permanent thing and secondly a bit painful. Both intricate and simple chest designs or art work look great depending on how you carry them and what meaning they portray. If you liked our selection, perhaps these other posts will interest you too, Bull Tattoos, Seahorse Tattoos, Tattoos On Feet and Spiritual Tattoos. This colorful tattoo will surely grab a lot of eyeballs with its mix of bold colors and exquisite designs. This predatory bird is all set to destroy and kill its prey. Adorn this tattoo and show your ambitious, cut-throat and shrewd side to the world. Make a style statement with this elaborate piece of body art. A mix of traditional and contemporary style with a hint of colour makes this look special and unique. Get this rich looking, beautiful piece of work and go shirtless with full confidence. A dash of colour and innovative style makes this tattoo a total hit. This piece of body art looks so grand and spiritual at the same time. It is so eye catching and masculine. Proclaim your love and respect for your parents through this unique and lovely tattoo on your chest and it could also be the best gift you ever gave to your parents! Flaunt this rare and dangerous looking tattoo and it will surely make you look super tough and not to be messed with. Show your dark side to the world with this scary but wonderfully intricate tattoo. Never underestimate the seductive and all-encompassing power of the devil. Get this tattoo and show your mean side with style. This rare, intricate piece of art depicts evil in its purest form. The innovative mix of the skull and the wings gives it an exciting look. This tattoo is an exciting combination of both pure and the evil, it has both dark and bright colors, elaborate art work, the third eye in the middle and two opposing devils side by side. This tattoo covering your chest and just one arm is super stylish and has a substantial thought or meaning behind it. Flaunt it if you believe in total freedom of the spirit and independence. Show the world what your city means to you with this catchy phrase and beautiful picture in the centre. Look like a deadly warrior from the ancient world with this dark, elaborate tattoo on your front side. This tattoo has a lot of color, dynamism and is playful too. Go for this rocking stylish tattoo if you want a unique look. This tattoo has a deep, inner meaning attached to it. It is depicting life, passage of time a lot of other things. Go for this if you feel a deep connect with this art work. This tattoo has a lot of written stuff and beautiful art work in the middle. The phrases have hidden meanings and makes the tattoo look even more creative. This two-faced demonic tattoo can give a satanic feel and look; flaunt it if you have the guts! This alluring piece of body art has a lot of meanings attached to it, and is symbolic of love, lust and passion. This tattoo would be apt for a bold person who loves to be in the waters and has experienced a lot of adventures at the sea. This is an exclusive mix of dark and bold colors with the owl in the centre giving it an eerie look and feel. Flaunt the mantra or motto of your life on your chest with this beautiful and elaborate tattoo. This tattoo is apt for someone who loves to express themselves through their music. A music lover can see the hidden meaning behind this body of art. This beautiful, intricate tattoo has so many eye catching and soothing colors; get it if you want a very different and unique look. This simple tattoo with separated pair of beautiful grand wings can give a man a very dark masculine look. This is an unusual piece of art with a creative mix of colors and intricate designs. The icing on the cake is the phrase in the middle.